Boys co-captain Ian Winthrop ’08 said “All the way down the racecourse we got battered by waves and wind gusts–we might have a couple good strokes until the boat hit some rough water and we’d lose our momentum.” Despite the weather, Winthrop felt there were some bright spots to the race: “Before we hit the worst water, we managed to settle into a really solid rhythm right around the 300 [meter] mark, instead of the 900 where we really picked up speed in the first few races.” Though the first boat pulled a length ahead of Andover in the middle 500, Andover made an impressive move in the sprint. “They walked on us in the last stretch of the race, it was really close at the end,” Winthrop remarked. The first boat, which changed its lineup late this week due to an illness, is undefeated heading into its last dual race this weekend against St. Paul’s School. Girls co-captain Allison Courtin ’08 said “It was a hard race to tell how well we rowed. Any stroke where we had all eight blades catch at once was a small victory. We also had to abandon our race plan since the conditions were so unpredictable. Instead of longer power 10s and 20s, we did more bursts of power to keep focus in the boat.” This is the fourth consecutive sweep by girls first through fourth boats–an impressive feat that might be a first in the program’s history. They head into their last dual meet versus St. Paul’s School totally undefeated. 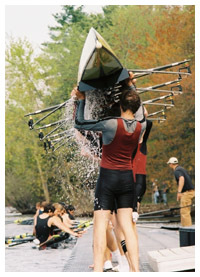 Next weekend, all twelve crews will travel to Concord, NH to race St. Paul’s School on their home racecourse. This will be the last race of the season for the 4th, 5th and 6th boats on both the girls and boys squads. The 1st, 2nd and 3rd boats will race for medals the following Saturday, May 24, at the New England Interscholastic Rowing Association (NEIRA) Championship Regatta in Worcester, MA. Photos added, courtesy of Towny Manfull and Diana Davis.